July 31st, 2014 | Moving Tips, Organizing and Decorating. The second most important room – the first being the kitchen – to unpack after moving your household goods is the bedroom. The bedroom should be a place where you relax and prepare yourself for the day ahead. Relaxation will come much easier if the bedroom is organized and clean. In part two of our organization series, we will focus on just that. Separate the bedroom into four clutter zones: closets, bedside/bed, dresser and accessory furniture. The solution lies in reorganizing these zones so everything has its proper place and you remove what doesn’t belong. The closet is the cornerstone of bedroom organization. Clothing causes the most clutter, which in turn means a lot of what you wear isn’t in its proper place. The closet can be an easy to organize thanks to various products, such as shoe cubby shelves, specialized multi-garment hangers, belt racks, revolving tie-racks and wall-or-pole hung canvas shelving. The first step in organizing your closet is assessing the space by removing everything and measuring the dimensions. This will determine where storage should go. • Is the article more than two sizes too big or small? If so, consider giving it a way. A drastic change to your body will take months, if it happens at all. • Has it been more than a year since you wore the piece? Donate it because you probably won’t wear it again. • Are the clothes in bad condition? If favorite shirt has holes or is severely worn out then throw it out! • Have you changed careers or left a line of work? It’s probably time to get rid of the clothes of your past working life. Limit the amount of clothes that will be hung because folded clothes, such as pants and button down shirts, take up less space. Hang up the remaining clothes with appropriate space between items. This keeps them clean and wrinkle-free. To ease search, keep similar type clothes, such as suits, dresses and blouses, together. Put the rest of your clothes on shelves in the closet. Allow the shelves to be adjustable for changing storage needs. Wire shelving or laminate shelving are types that can be used. You may want to include a drawer or pull out trays to store smaller items. Shoes also are a culprit of creating chaos in a closet. Keep shoes off of the floor by using wire racks, shelves or hanging a shoe holder on the closet door. If you don’t want to spend money on such products, use your old shoe boxes, label them and place them neatly in the closet. If the closet is shared, create a border between your space and your partner’s space. This area includes the bed, the area around your bed and your nightstands. Nightstands are great for books, décor, alarm clocks and a place for your cell phone when it is charging. Nightstands should have a drawer to conceal items like medications, TV remotes and flashlights as well as a shelf for books and magazines. If the items in the nightstand aren’t used while you are in the bedroom then they do not belong in there. Most beds provide a great place for storage. Under the bed is a great place for items like comforters, extra sheets and pillows. Be sure to measure how much space is under the bed before buying storage containers. Luggage that isn’t used frequently can be used as an under the bed storage, but be sure to have it accessible when needed. A bed skirt is a great way to conceal these items. The dresser can be a challenge because it tends to be where everything goes when it doesn’t have a place. Start by removing everything from the dresser and get rid of old clothing – follow the guidelines from the closet section. Give everything a set place. Whatever you put on top of the dresser should be self-contained, for example, jewelry in a jewelry box and cosmetics in a makeup bag. You may have room for excess furniture in your bedroom. This furniture should have purpose so it doesn’t end up being clutter or in the way. Chests or trunks provide long term storage options for extra blankets or seasonal clothing. Place this at the foot of the bed. Other accessories include chairs, small tables and desks. Keep these out of the flow of traffic. When positioning a TV and/or DVD player, place it on a recessed shelf close to an outlet and in an ideal location for you to see it. Secure the cables to the baseboards. Schedule time periodically to clean and reorganize once a month. 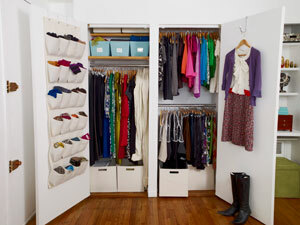 Look at the items in your closet every three months and remove older items you no longer wear while adding new clothing. After doing laundry and before placing items back into the dresser, take a minute to ensure your dresser is organized. Get in the habit of making a weekly visual sweep of the bed and surrounding area. Clean under the bed monthly as it tends to get dusty quickly. Come back Monday, August 4 for the organization of kid’s bedrooms.